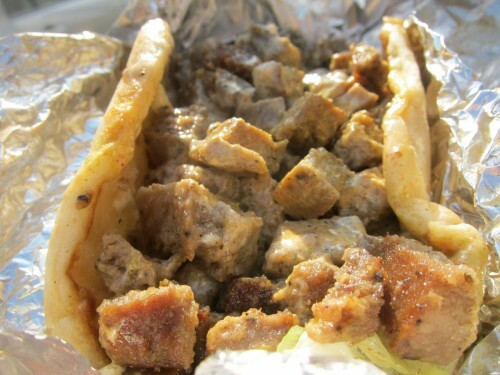 From cabby to foodie! Sammy is immigrant from Pakistan who knew that he needed to be more than just another Pakistani cab driver in New York City. 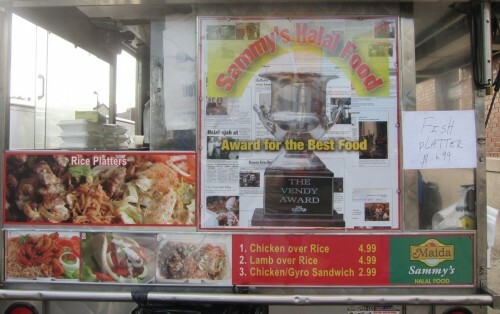 That has been the journey of Samiul Haque Noor of Sammy’s Halal who won the Vendy award for best street food cart in 2006. 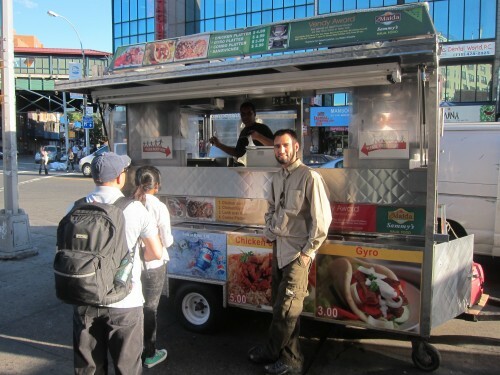 Ever since then Sammy has been busy expanding his chicken rice food cart mini empire from his flagship cart on 73rd Street and Broadway in Jackson Heights to more in Astoria and three in downtown Manhattan. The secret to Sammy’s success is the ingredients he uses. 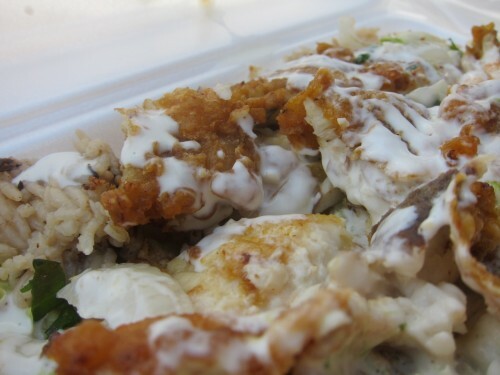 Unlike his competitors over at 53rd and 6th, Sammy uses really good meat and rice makes his dishes superior in quality and taste. Where the other guys win are on the sauces. 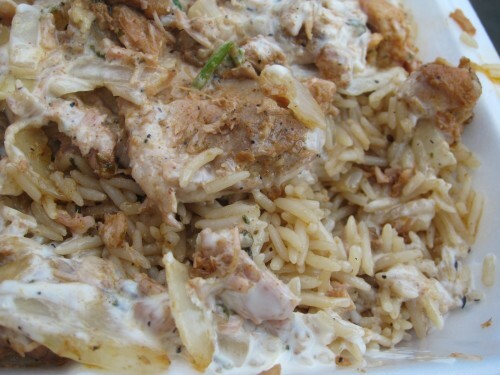 The perfect chicken rice platter could be created using Sammy’s meats and rice and the Halal cart at 53rd and 6th’s sauces. 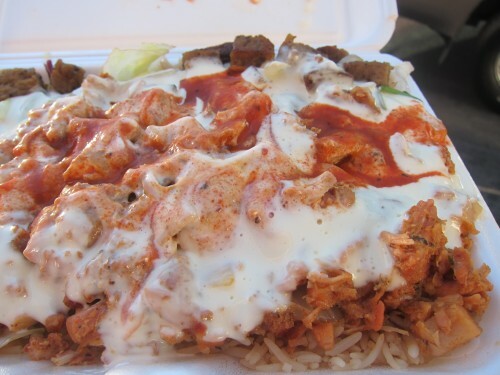 My favorites at Sammy’s are the lamb and the chicken rice platters. He has now also introduced Indian food with combinations of daal, chili chicken, biryani and kathi rolls. Sammy is not just about the food. He truly has a passion for what he does. In speaking to him, he expresses how much pleasure he derives when late night revelers stop off at all odd hours of the night at his cart. The only thing that can quiet down these party goes is the delicious food that Sammy offers them and nothing delights him more than that. 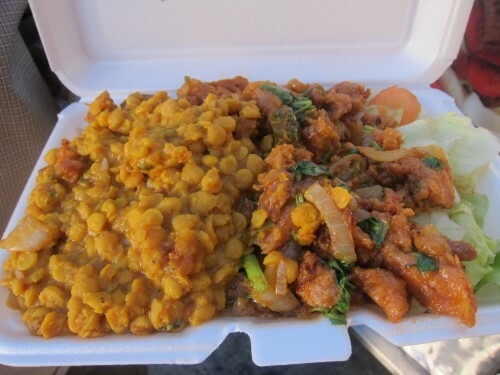 This entry was posted in INDIAN, Jackson Heights, MIDDLE EASTERN and tagged best chicken rice food cart in Jackson Heights Queens New York, best chicken rice food cart in new york, best chicken rice food cart in New York city, best chicken rice food cart in queens, best chicken rice food cart vendys, best chicken rice Sammy’s Halal Food Cart, best dishes at Sammy’s Halal Food Cart, best food cart in New york city, best food carts in Jackson Heights Queens New York, Best food in Jackson Heights Queens New York, best food spots in Sammy’s Halal Food Cart Jackson Heights Queens New York, best halal food in Jackson Heights Queens New York, blog posts on Sammy’s Halal Food Cart Jackson Heights Queens New York, blogs on Sammy’s Halal Food Cart Jackson Heights Queens New York, food ratings Sammy’s Halal Food Cart Jackson Heights Queens New York, ratings Sammy’s Halal Food Cart Jackson Heights Queens New York, reviews of Sammy’s Halal Food Cart Jackson Heights Queens New York, Sammy’s Halal Food Cart, Sammy’s Halal Food Cart Jackson Heights Queens New York, Sammy’s Halal Food Cart reviews, Vendy awards winner food cart, vendy winners, what are the best dishes at Sammy’s Halal Food Cart Jackson Heights Queens New York, what to eat at Sammy’s Halal Food Cart, where is Sammy’s Halal Food Cart, where to eat in Sammy’s Halal Food Cart Jackson Heights Queens New York. Bookmark the permalink.